What constitutes responsibility and liability in the eyes of the law? If a law is broken, how clear-cut is the guilt or innocence of the individual breaking that law? This debate has gone on for centuries, with efforts made to account for varying degrees of culpability depending upon the circumstances. For example, in the Old Testament, the Mosaic law recognized degrees of murder, both intentional and accidental, with different penalties to be exacted in different situations. Law and the Modern Mind explores a formative era in American history. It begins in the 1700s as the infant nation began to wrestle with its freedoms and forge new directions in jurisprudence. At the beginning of this period, white males had the legal supremacy in terms of rights and privileges, with women and racial minorities (particularly slaves through much of the 1800s) in subordinate positions. The laws of the time were couched in language that reflected this assumed superiority of white males. Part of the evolution of the legal system involved an expansion of rights beyond this segment of society. This period also saw a move away from the somewhat Calvinistic emphasis on predestination and depravity toward a more liberal Protestant (one might argue a humanistic) emphasis on the goodness of man. The earlier rigid laws began to be strongly influenced by an Enlightenment mentality that focused to a great extent on the “reasonable man.” Blumenthal describes in detail how this shift in outlook influenced the courts. One major debate of the time (which carries on into today) is the issue of consciousness, especially as it relates to responsibility and liability. Philosophers were developing arguments that examined this topic. Scientists of the time also asserted their claims as to what constituted the mind. Were humans free agents possessing souls that governed and guided behavior? Was behavior simply the end result of physical processes, rendering us all mere puppets of these processes, with little or no control over our behavior (and therefore not responsible for our actions)? Blumenthal brings a thoroughly detailed analysis of the times and the legal questions to the table. She explores court cases, religious and philosophical issues, and a multitude of legal sources to the discussion in order to give a clear picture of the debate that continues today. She does not offer a specific answer (is there really only one solution to the question? ), but provides a comprehensive overview of this complicated topic. Some readers might be a little disappointed in the limited scope of the book. 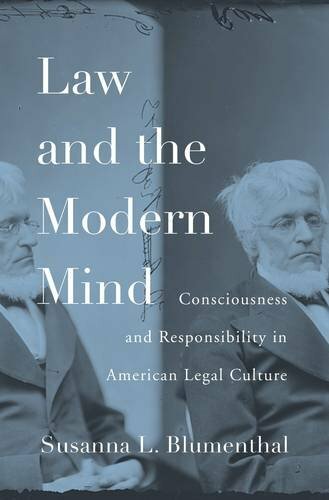 The subtitle “Consciousness and Responsibility in American Legal Culture” could suggest an exploration of modern-day issues regarding responsibility and the neurosciences. With the growth in knowledge about brain chemistry, brain imaging, and connections between brain function and behavior, the issue of individual culpability is taking the forefront in legal discussions today; however, the author has wisely chosen to limit her coverage to some fundamental ideas that undergird much of today’s debate. The book is exhaustively documented, reflecting the thoroughness of Blumenthal’s research. Citations are taken from a wide variety of sources, including scholarly journals, case law, and academic texts. Included are a number of specific examples, such as a case involving an insane man who burned down a house and barn jointly owned by him and his sister. Law and the Modern Mind provides an excellent and thorough coverage of legal history, yet is as timely as the headlines in the morning newspaper with regard to one of the knottiest issues in modern jurisprudence.